In his review of George R. R. Martin's A Dance With Dragons for Time magazine, Lev Grossman repeats the claim that he made in 2005: that Martin is "the American Tolkien." Grossman writes that Martin "has produced — is producing, since the series isn't over — the great fantasy epic of our era. It's an epic for a more profane, more jaded, more ambivalent age than the one Tolkien lived in." Unlike Tolkien's The Lord of the Rings epic where good and evil are clearly delineated, Grossman argues, in Martin's A Song of Ice and Fire saga "it's impossible to know whom to root for." In many regards, Grossman is right. The moral and political complexities of Martin's A Song of Ice and Fire series set it apart from the much simpler world of Middle-earth where Elves are good, orcs are evil, and you know that you're rooting for the hobbits to make it to Mount Doom. And if Grossman's claim had been that Martin is a Tolkien for our age--an age of constantly shifting alliances, moral questions where absolute right and wrong answers are elusive, and a sense that you never know where you belong--well, then I would have agreed with him. But instead, Grossman claimed that Martin is "the American Tolkien." And with that, I disagree. This second link provides a nice transition to two reviews of Martin's latest book--A Dance With Dragons--that we found noteworthy. The first, written by Lev Grossman, was published in Time magazine; the second, written by Dana Jennings, was published in The New York Times. What we found interesting was how both of these reviews compared Martin to Tolkien in a very favorable way. Grossman calls Martin "the American Tolkien," and Jennings takes it a step further, ending her review with, "Tolkien is dead. 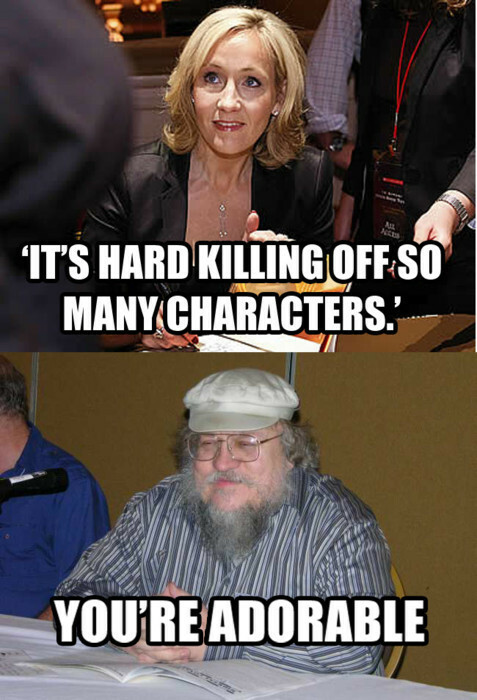 And long live George Martin." I haven't had a chance to watch Harry Potter and the Deathly Hallows (Part 2) yet--I'm going this weekend--and I haven't read any reviews yet either, so that my viewing of the movie will be as unspoiled as possible, but from the snippets of things that I've seen, the reception looks quite positive so far. Have you seen it yet? What do you think? Let us know in the comments! With seven books in the series, and eight movies that bring those books to life on the big screen, there's a lot to like about the Harry Potter franchise. But even though there's a lot to choose from, my guess is that most people have a favorite part--a favorite book, a favorite movie, a favorite character, a favorite Quidditch match, or maybe even just a favorite sentence. For some, their favorite moments have more to do with the experience of reading or watching the series, rather than specific parts of the stories themselves. Here is a collection of some of our favorite moments from the series, but we'd love to hear about yours in the comments as well! Kat Howard: I would just like to state for the record that I had made this choice before I saw this picture. I love Neville Longbottom. His character arc is wonderful, and I love that being a hero does not come easily for him, but it does come naturally. My favorite moment is in The Sorcerer's Stone, when Neville tries to stop Harry, Ron, and Hermione from leaving the Gryffindor common room, and is so fierce and determined about it, he winds up in a full body-bind, courtesy of Hermione. As Dumbledore says, "It takes a great deal of bravery to stand up to our enemies, but just as much to stand up to our friends."